So it’s no surprise that the locals have informally renamed the town B’bos – imagine saying ‘Baardskeerdersbos’ every time someone asks you where you live? I believe that there are very few run-ins with said spider nowadays, even if the little hamlet remains small and the surrounds largely undisturbed. Baardskeerdersbos is a largely rural town that lies in a part of the Cape Overberg only recently discovered by travellers. The beautiful town is only 20 kilometres from Gansbaai and just a little further down the road from Stanford, but the road is a gravel one, and the area incredibly tranquil largely because of this. This could all soon change as there is talk of tarring the road. Most residents are really pleased about this, as it will bring further traffic. Some are horrified by the prospect of having their tranquil lifestyle disturbed. The town has attracted a large number of artists – at least 12 of them. In such a small space, this is a fair number of artistic temperaments. But if anything, the town seems to have flourished. Not least because it has designed an art route that happens three times a year, bringing a surge of visitors. You might not have heard of B’bos before now, but you will hear more about it, soon. It’s our last day in the Overberg and the first to produce clear skies without the threat of rain. Baardskeerdersbos is on our way out of the valley, if we use our imagination, and I’m really keen to see more of the sleepy hollow (we whisked through it on one of the windiest days possible earlier in the week). Having avoided gravel roads up until now we turn onto the road that takes us via Wolwengat, just 37 kilometres before we reach Napier, joining the main road that takes us to B’bos and Platbos Forest. I’m amazed that the town has managed almost total obscurity until now. 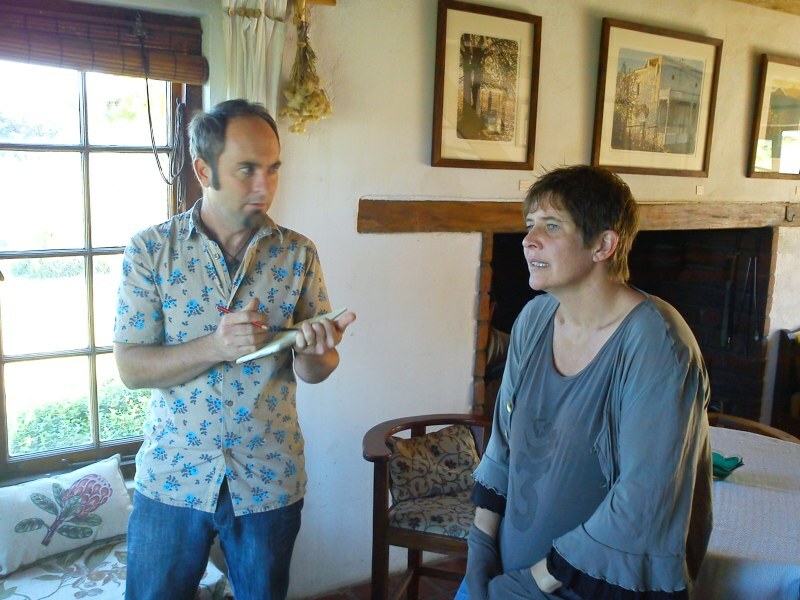 Amanda Jephson, who hails from Obs in Cape Town and has only lived on her pretty farm just outside B’bos full-time since 1995, although her horticulturist husband still commutes, reckons the original residents speak about people like her as ‘new’ – even here in the middle of the Overberg you find politics. In her beautiful gallery hang her paintings alongside those of her mother, Toni Jephson, and whilst we’re there admiring her paintings, an art critic arrives and draws her into conversation. It’s probably a good time to head on as there is lot to see and do on this art route. We move on to the home of Joshua Miles and his Scottish wife where I learn all about reduction block wood cuts, or as best as I can absorb from Joshua’s incredibly knowledgeable explanation, whilst I scoff his chocolate biscuits. In layman’s terms Joshua produces these incredible art pieces that all begin as a piece of wood. Bit by bit Joshua reduces the wood as he carves in extra details. With each carving ‘layer’ he adds a colour to the wood that he then transfers to canvas. From this he prints, using his printing press, just ten prints (12 actually, but two are to test the run). His wife, who is a cabinet maker, must make the frames. Joshua will no doubt shudder at my attempt to explain how he ‘reduces’ his wood with a set of fine Swiss chisels. Each time he adds a colour, he has to take into account the colour already on the canvas, and what the combination will create. His inspiration comes from Cecil Skotnes, his teacher, and his aunt who was also a wood cutter. He says he is very much influenced by light and impressionism. By the end of the piece his wood has been completely reduced. He laughs when he says that he’s already had one admirer of his work buy the wood along with the painting. He says Cecil Skotnes used to do that – paint on the wood afterwards and sell that too. Joshua is a thoroughly likeable guy, and his work incredible. 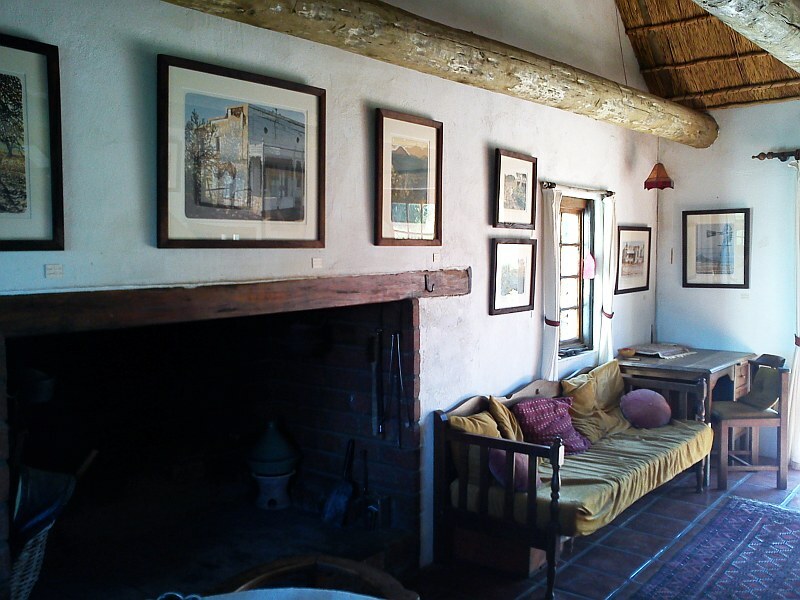 In the heart of the village, in a little traditional Strandveld cottage owned by her parents, is Nikki Miles who lives just up the road in Stanford, although she’s incharge of marketing the Baardskeerdersbos art route. Nikki would seriously love to move to B’bos, where her parents already live off-grid. She thinks the social life here is a lot more rewarding. 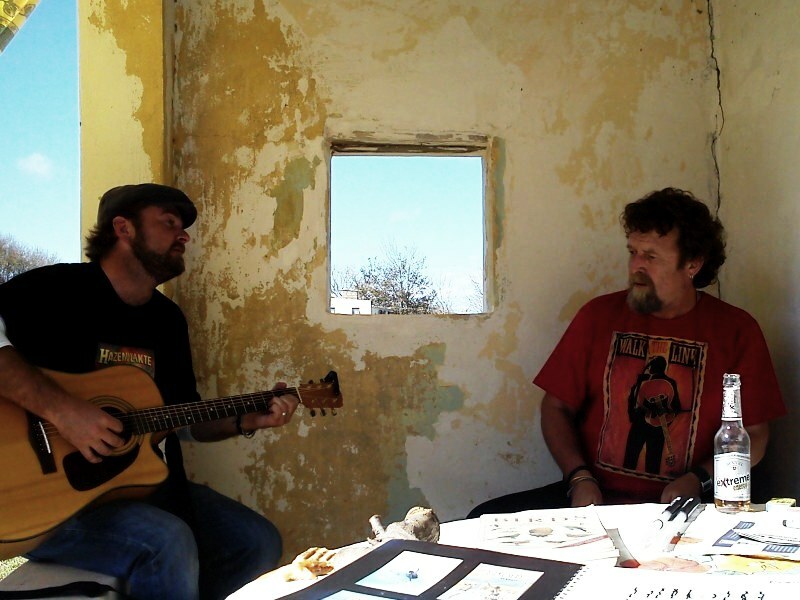 Exhibiting alongside her is autumn’s visiting artist, Vernon Swart, who also happens to have brought along other members of the Valiant Swart Band and they are busy strumming, drumming and crooning on the front porch – Vernon on a wooden block for drums. My other half is impressed. My son is even more impressed as they share their toasted sarmies and slap chips with him. He thinks these guys are simply awesome. Vernon’s art work is beautiful. His work has been described an ‘unique realist style featuring evocative nudes and dark moody landscapes’. Next to his beautiful landscapes hang Nikki’s striking charcoals of Nguni cattle. Side-by-side in this quaint cottage, they make one want to sit awhile. Nikki has plenty of time to chat. She’s warm, generous with her time, and enthusiastic about the art on display at B’bos. She pores us a glass of something and we stand around passing the time of day, whilst my son goes out for a third helping of chips. When she isn’t illustrating for publishers, Nikki is drawing – her first love. She works in pen, ink, charcoal and pastel. And you can see that she loves what she does. We wend our way further up the village to Granaatlaan and Niel Jonker’s home. His verandah is awash with people sitting eating at a table d’ote affair, whilst inside Niel is deep in conversation. I stroll around taking in the different mediums Niel uses to interpret his creativity. 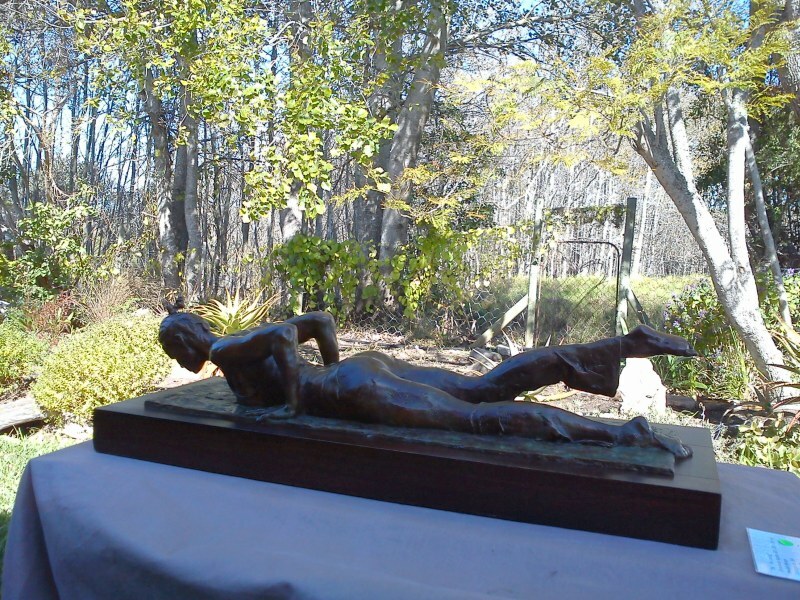 In the garden are a series of strong yet graceful bronzes, whilst in one of the rooms just off the verandah hang his paintings. He works with light, which he sees as a symbol of our experience of the universe and adopts what he calls an ‘irreverent approach’ to his subjects, resulting in compositions that look more as if he’s caught the subject from the corner of his eye than studied them directly. Niel is also a self-taught bread maker and oven builder, and believes in bread making as a slow process of making bread simply. He holds regular bread making workshops in B’bos, the last one fairly close to the art route weekend, making it easy for visitors to do both. By the time we reach Andree Bonthuys’s home, set in amongst fields of fynbos with incredible views, I’m beginning to think that B’bos is one incredible little town. Andree just confirms this. Andree’s house is inspiring. Something about where it stands and Andree’s energy combine to almost overwhelm me. Her land art, which expresses her concern with ‘fragile balances’, not only ecosystems but also the human condition, combine paint, stone, bone and the written word as a form of expression. 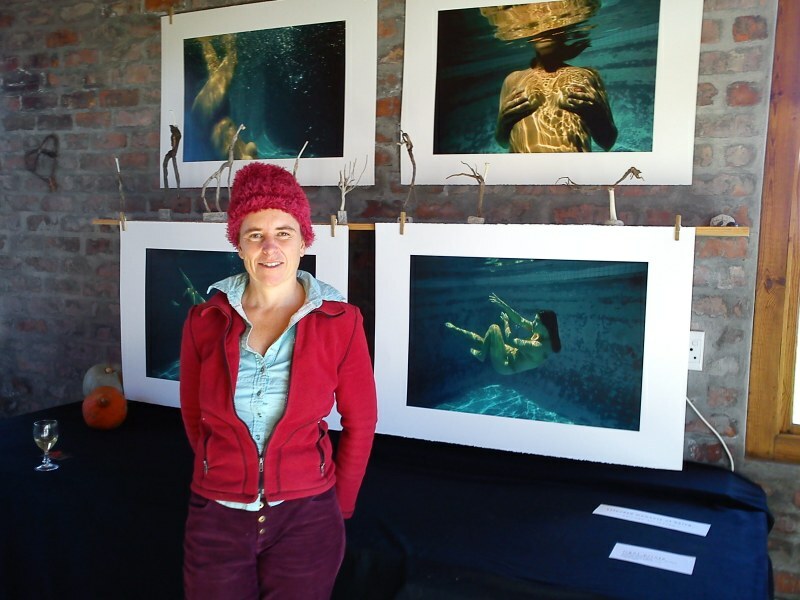 Alongside her, Kali van der Merwe, an award-winning docu/film maker, is exhibiting a series of her photographic images. 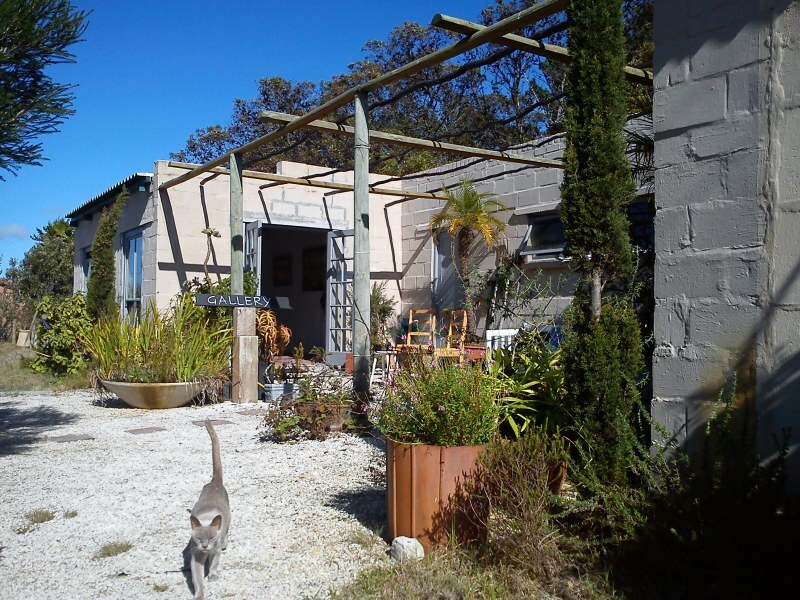 Kali has been living in the house for the last few months whilst Andree reconnects with Cape Town – she has decided to sell up and return to the city after living here for six years. Kali’s photographs are incredible underwater images of nudes. Her work is rich, the colours and the subject evocative. We finally tear ourselves away, knowing that we still have a good two-hour trip back to Cape Town. 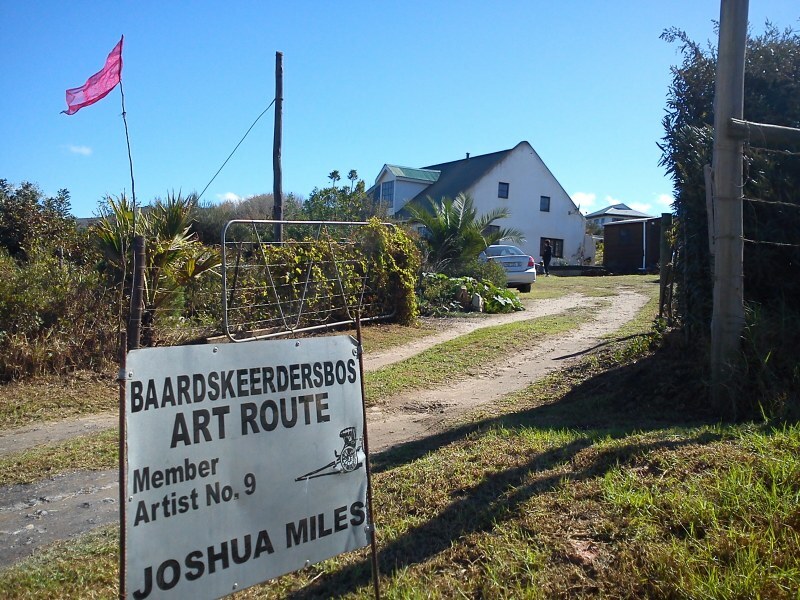 But Baardskeerdersbos is more than an art route, it’s an experience. One that allows you into the homes and hearts of the artists who live there, each of whom generously share not only their art, but their stories.